Thanks to Jessica and Ron for providing the pictures. We had camera issues. So I decided I had better hurry up and learn how to play the ukulele. I looked up some campfire songs and tried them all out on my 95 year old Gram, who was very encouraging. Gramps served an LDS mission to Hawaii back in the 20s and even learned Hawaiian, so I figured she'd be a good target audience. "Ooh, learn 'On The Beach at Waikiki'. Honikaua wikiwiki means 'kiss me quickly!' you know." Anytime I started playing 'Aloha Oe' Amelia would come running in singing and dancing. 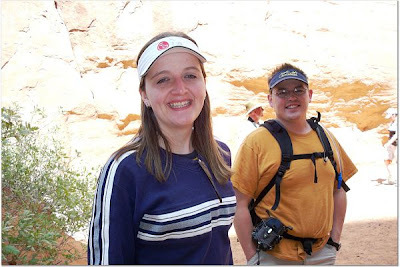 So the day came and we met up with some of our best friends, Jessica and Ron, and headed down to Moab! 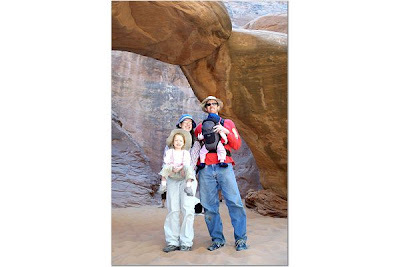 Moab is beautiful in May, and we had a really fun time sneaking around downtown looking for a few letterboxes. Then it was time for 'campfire hyjinx' (as stated in the flier from church) and I was first. I hoped everyone would be too busy roasting marshmallows to really pay any attention. A few fun talents went after me, and then a storm rolled in! Matt and I dashed the kids off to the tent, where moments later a gust of wind broke our tent pole. 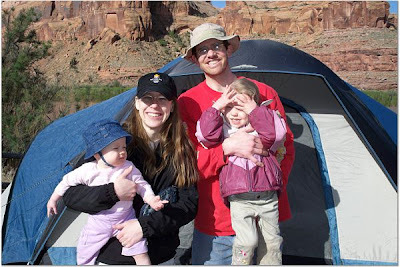 Amelia, Ellie and I ended up sleeping in the Tahoe while Matt roughed it out in the tent. 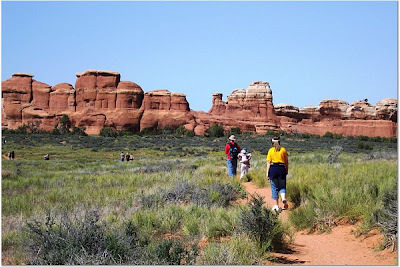 The next day we went to Arches National Park. Hiking in the Desert. I'm carrying Amelia on my back, and Matt is carrying Ellie in the snugli on his tummy. God's creations are so amazing. I looked around in wonder and awe at all that was around us. 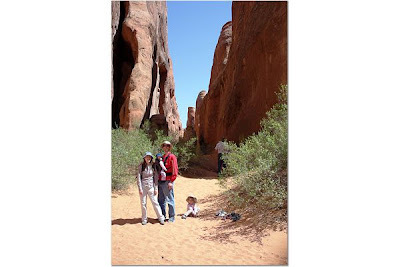 Our favorite hike was Sand Dunes Arch. 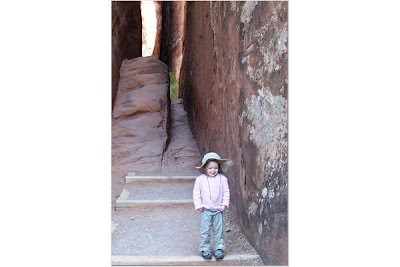 Amelia on the trail at Sand Dune Arch. We started at around 2:45, and thanks to the rock formations around us, the hike was shady and cool. (It was a hot day!) There was fine sand all along the trail, and we took off our shoes and Oh! did it feel good. Amelia squeeled with delight and ran all over. Ron would pop up on a rock or behind a bush and say in a high voice, "Amelia!" and she would giggle and laugh. We really had a good time. We love Jessica and Ron. We are so blessed to know them. You should check out their web site and get to know them, too. Jessica and Ron. They're trying to adopt, and they will be fabulous parents. You're nice...and we can't wait to see your new haircut! 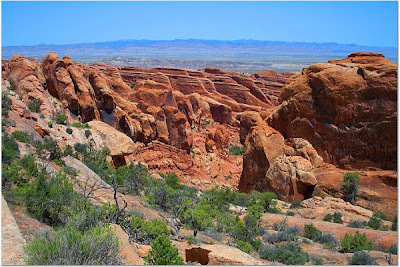 There are so many things to do in Moab, I'm sure you would enjoy it. 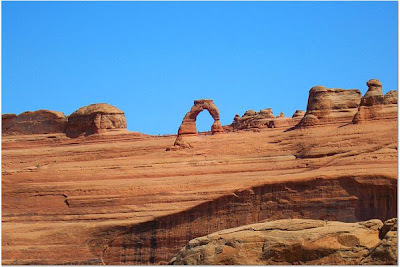 The picture of delicate arch was taken from a view area which is wheelchair accessible, but I'm not sure how many other parts of the park offer such areas. Check out Arches' website. (I put the link in the blog).